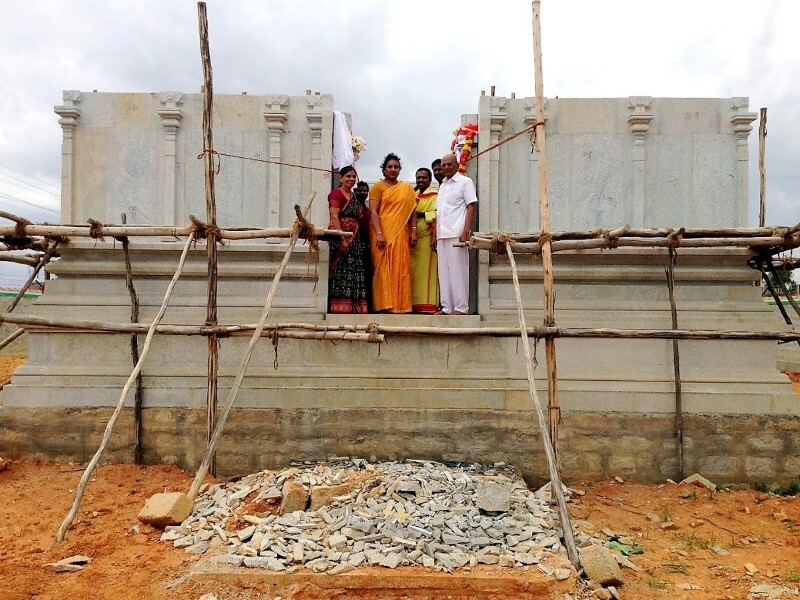 As a humble attempt to reciprocate Her infinite grace and unparalleled mercy, and keeping up with the age-old Hindu tradition of building temples, Balambika Divya Sangam started construction on a magnificent temple for Sri Balambika at Malur in 2011, with Kumbhabhishekam scheduled for April 10th, 2017. 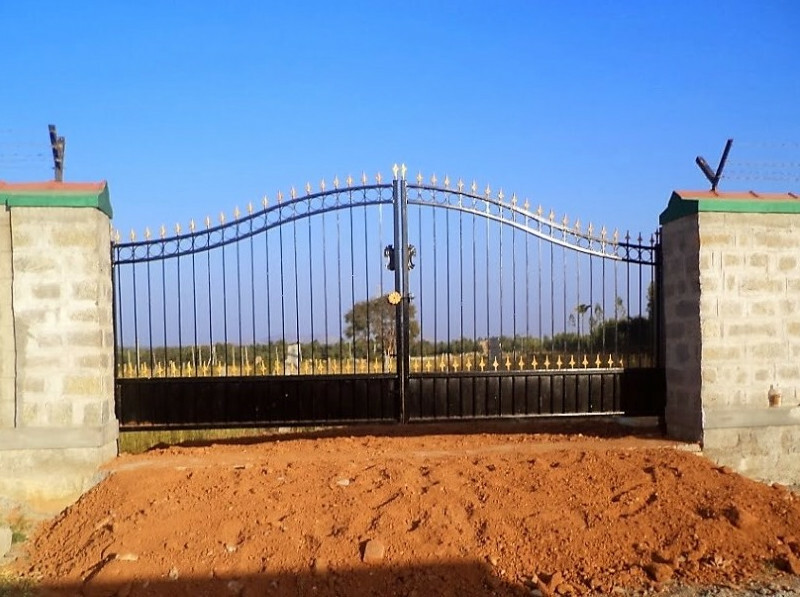 Situated around 50 kms from Bengaluru, the town of Malur or Malligepura is blessed with plentiful water, beautiful landscapes, and lush greenery. With the aromatic scent of eucalyptus groves and mallige flowers permeating the air, Malur truly seems to furnish the perfect environment for a tranquil and spiritually uplifting experience. 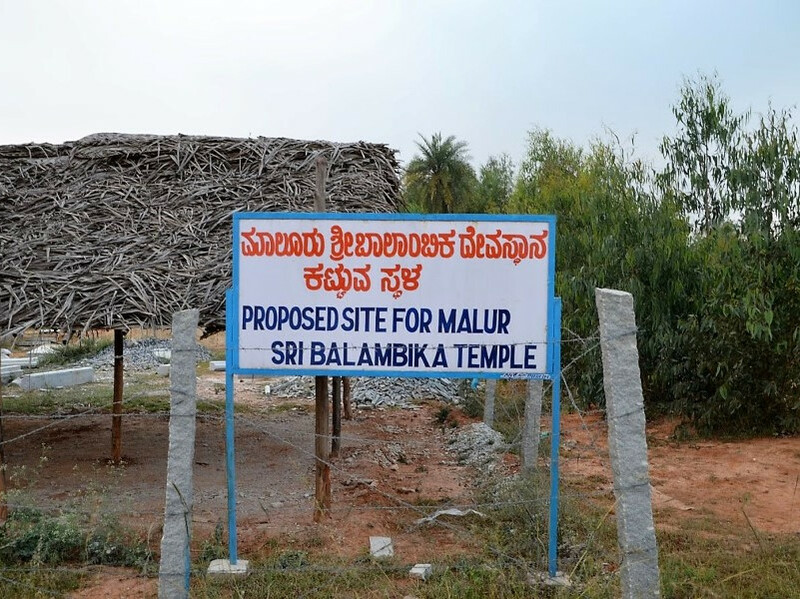 Inspired by the exquisite Chola Dravidian style of temple architecture, the Malur Balambika temple would serve as a beatific abode for Sri Bala, that devotees from all walks of life could visit, to invigorate their spiritual energy. 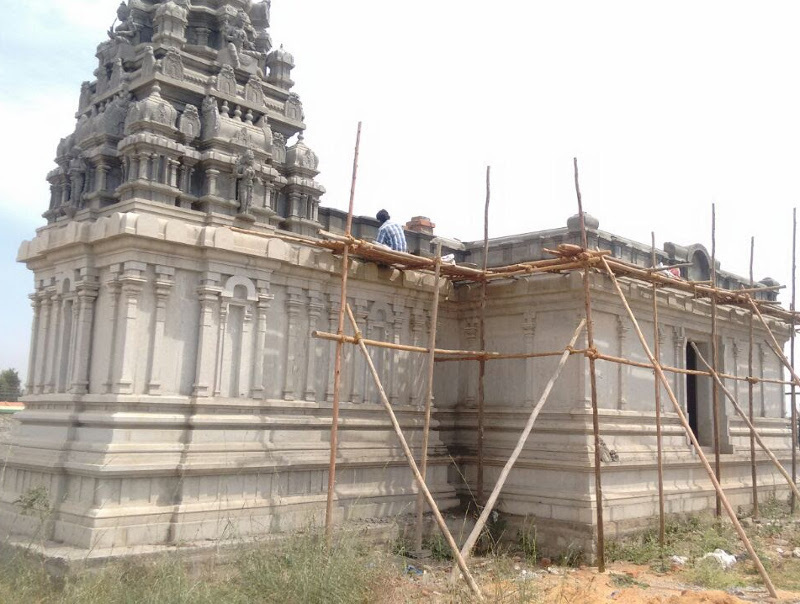 In addition to being a treasure trove of intricate art and design, the temple would also serve as the administrative hub for a multitude of socio-economic outreach activities of the Sangam, many of which already are in full swing in Malur. Sri Balambika temple at Malur derives inspiration from the Gangaikonda Cholapuram temple. 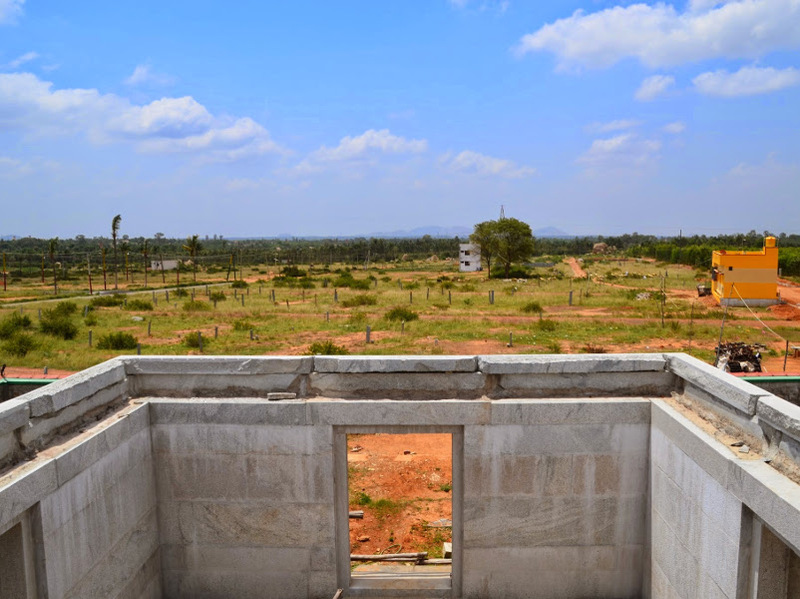 Constructed over an area of 12000 sq.ft., it is a rectangular-shaped structural temple that generously applies the archaic and well-chronicled Chola-Dravidian style of temple architecture. 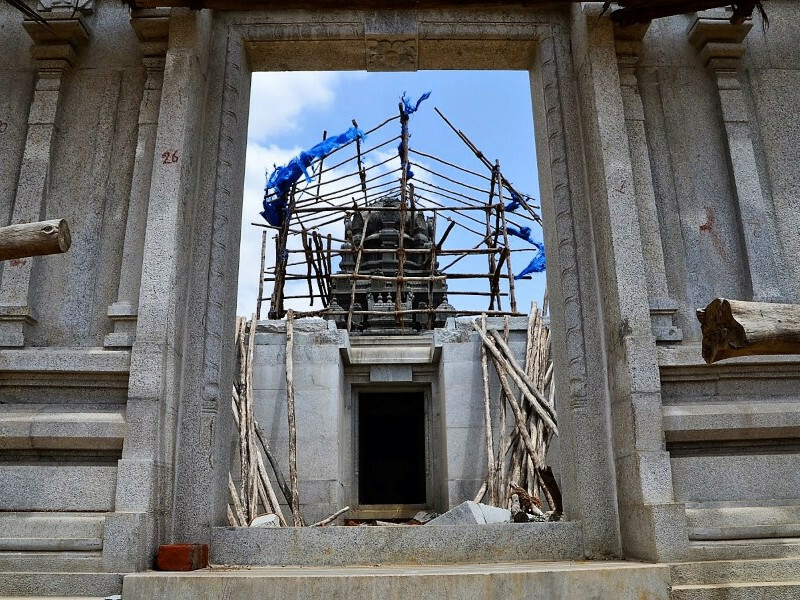 Apart from a few sections and the Vimanam built from sudai (cement), the rest of the temple is constructed wholly in stone, exhibiting an architectural grandeur that would leave anyone astounded. The Sthala Vruksham of this temple is the Kadamba tree, as ‘Kadamba vana Vasini’ is one of Ambal’s innumerable epithets. 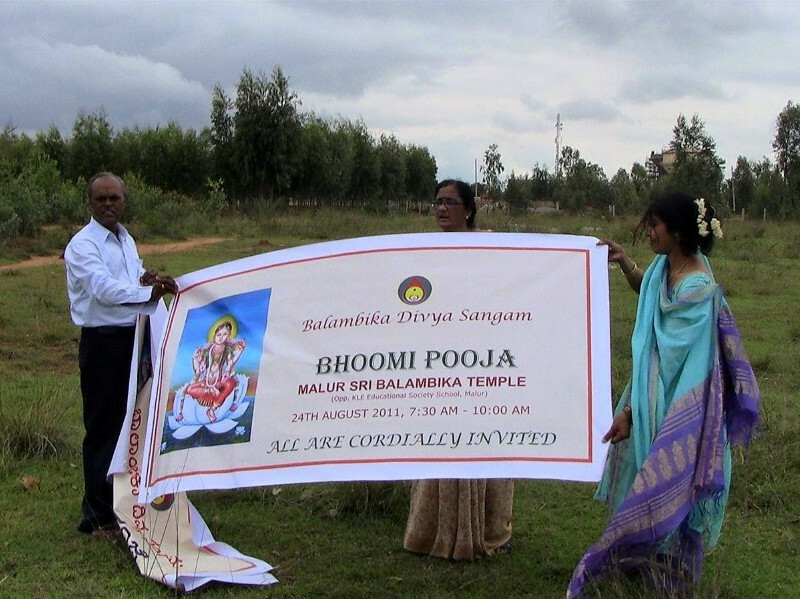 At the entrance, we are greeted by Dwajasthambam. The Dwajasthambam is referred to as being a medium for the Heavens to be connected to the earth, which would refer to it being a spiritual connector between us earthlings, and the Supreme Being - God.The Sanskrit word for the flag is ‘dhvaja’ and it means whatever is raised. In the religious sense, whatever raises man to a higher level of understanding and activity is a ‘dhvaja.’ The flag also suggests hope and desire to overcome ignorance. 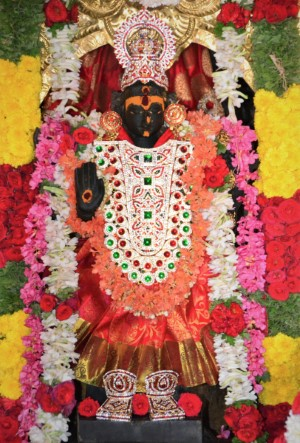 Dwajasthambam gives an idea to a devotee from a long distance about the idol installed in the temple. A Dwajasthambam usually represents the prosperity and pride of a temple. It can be noticed that the top of the DhwajaStambha is the highest point of the temple, and thus, whenever lightning would strike, the temple would be saved from the devastating damage that could have been caused. This is what could be meant from the explanation that it connects "Heaven to Earth" (i.e.) it conducts the charges from the clouds above during lightning to earth or ground, which is the electrical term for a no-potential area. 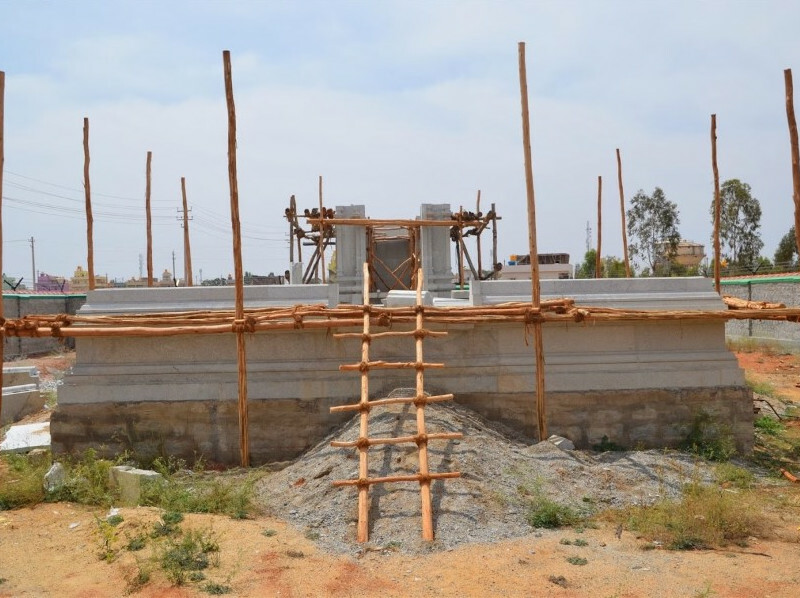 Dwajastambham is a kind of Antenna like structure which receives the cosmic rays and brings it down to the premise of temple. As you stand in front of the dwajasthambam, the four sides of the pillar catches your eye , each side has the sakthi parivar namely, Siddhi Vinayaka, facing the main entrance on the east and facing west is Murugan and on the north and southern side we have Parvathy and Shiva in the form of lingam. Moving forward you see the Vimanam which is holds the kalasam of the temple. The Vimana in the South Indian temple history had an interesting career. For instance, the most magnificent Vimana of the Raja-rajeshwara temple at Tanjavur (1009 AD) rises to an imposing height of 58 meters. Another temple of the same period at Gangaikonda-chola-puram (1025 AD) rises to a height of 48 meters. Thereafter, in the subsequent periods, the Vimanas tended to grow shorter. But the Gopuras, the towers that stand over the gate-ways (dwara-gopura) became increasingly ornate, complicated and huge. 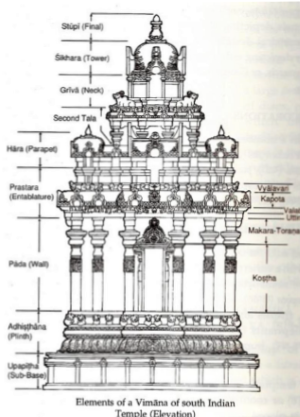 While the temple complex is designed as a Mandala with the sanctum at its heart (Brahma –sthana); the sanctum along with the Vimana atop is itself regarded a Mandala. The image is located in the mid-point of the sanctum which is designed as a square; that is, where its diagonals intersect each other. 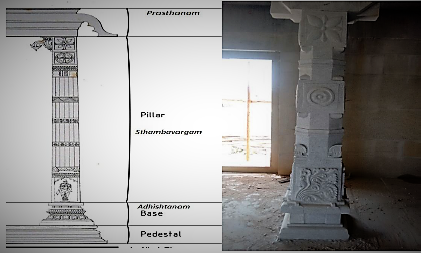 This point is elevated, in a three dimensional projection, and rendered as the sthupi or the central point of the Vimana. The Kalasha is installed at this point. 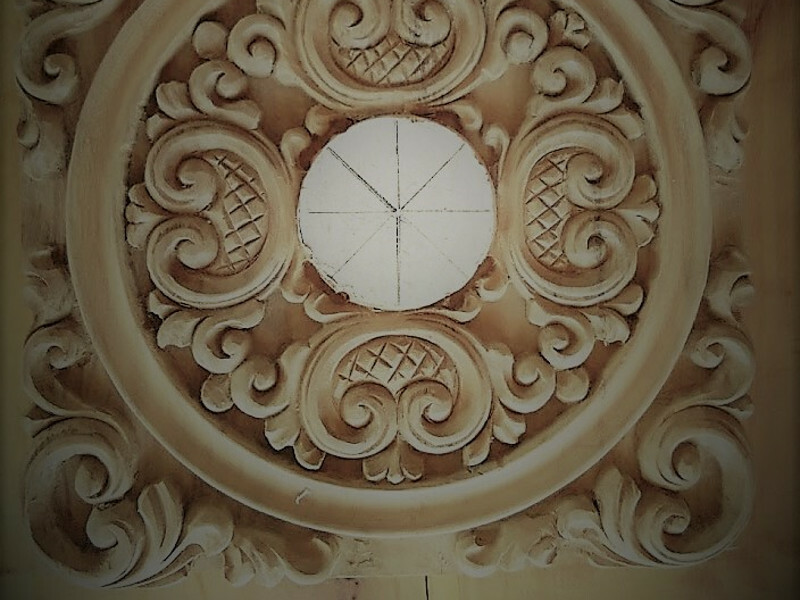 We believe that the universe features a cyclic nature of creations and destructions and since the temple represents the universe, it had to embody the cyclical notion. For that reason a pattern of growth is added. This pattern grows from unity to multiplicity, simultaneously tending back to unity through a process of dissolution and fusion. The sthambavargam is adorned with exquisite ornamentation on all faces, with an artistic interplay of figures of concentric circles, hamsams (swans), and floral abstracts, in a unique alternate arrangement. The roof of the mahamantapam adds its finishing touch to this artistic opulence, with ornate padams carved in stone. 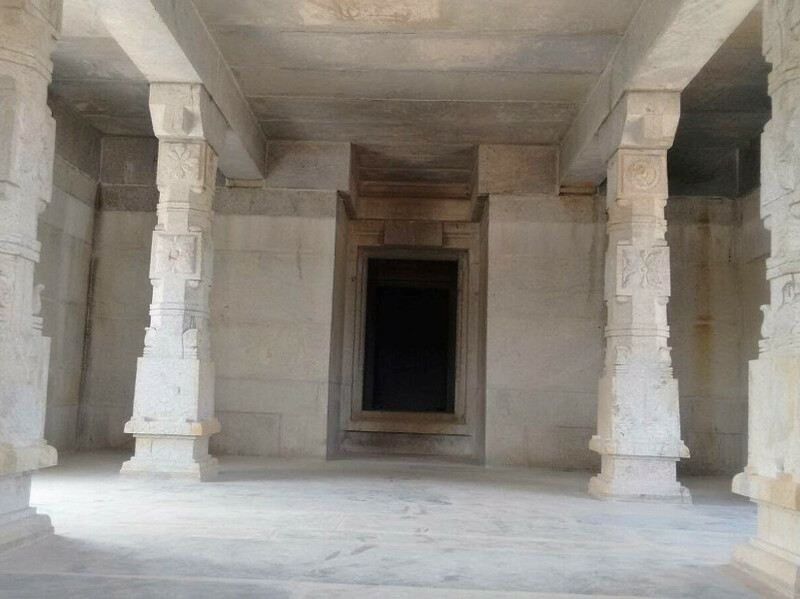 Apart from the main doorway, the mahamantapam can be accessed from entrances in the north and south. A flight of steps with yali (mythical creature seen in many Hindu temples, which is part elephant and part horse) sculpted onto it, opens into the praharam, or circumambulatory path. The mahamantapam paves the way into the ardhamantapam, which eventually leads to the inner sanctum sanctorum or garbhagruham. Above the doorway of the ardhamantapam is the mugappu thotram (bracket figure) of Sri Gajalakshmi, seated in a padmasana posture and bestowing materialistic and spiritual wealth and prosperity. The entrance of the ardhamantapam is closely guarded by two female dwarapalakas, Varahi Devi and Raja Shyamala on either side. 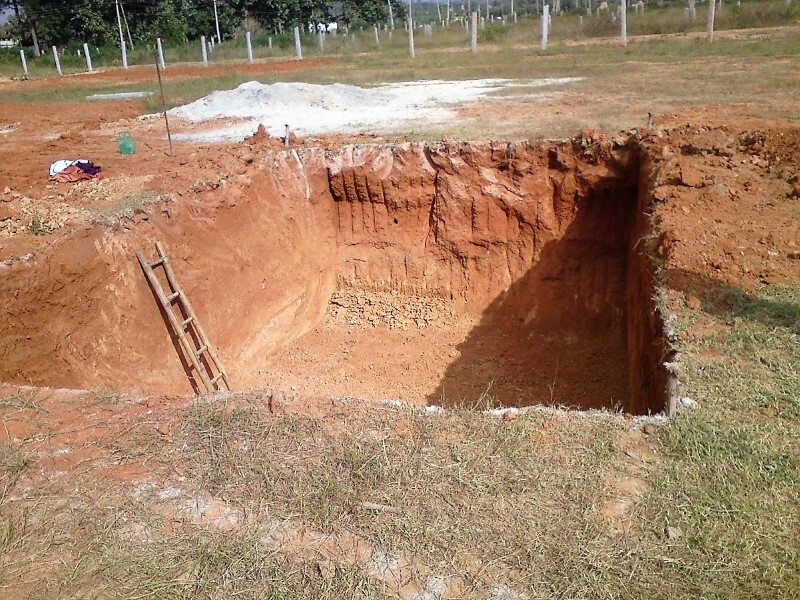 As outlined in Sri Lalitha Sahasranamam, Lalitha Devi was helped by Her Prime Minister Raja Shyamala, and Chief of army Varahi Devi, in the legendary war against the demon Bhandasura. Traversing through the mahamantapam towards the garbhagruham is a spiritually uplifting experience, as one gets the first glimpse of the main deity, Sri Balambika, majestically standing on an upapeetam in a regal stance as Raja Bala. connection between atma and paramatma remains, reminding oneself of Her unparalleled grace and unconditional love. Another remarkable feature of this temple, is the Ardha Bimbam of Sri Raja Rajeshwari, the Universal Mother, on the western wall of the garbhagruham, facing east. 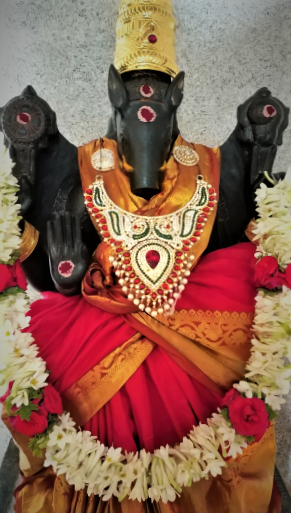 The sight of Sri Raja Rajeshwari and Her child-like form Sri Balambika giving darshan together, makes one feel that their spiritual journey is consummate. "I shall immediately kill those sons of Bhanda who have come here"
After making up her mind Bālāmbā submitted to the great queen. "Mother, the sons of Bhaņḑa, the great Daitya, have come to fight. I wish to fight with them. I am interested in this because I am a young girl. My arms throb with an itching sensation for war. This is my playful activity. It should not be curbed by your orders for prohibition. Indeed I am a girl loving toys and playful pastimes. By this play of fighting for a moment, I shall become delighted mentally." "Dear child, your limbs are very tender and soft. You are only nine years old. This is your first step and performance. Your training in warfare is fresh and recent. You are my only daughter. Without you, my breathing activity does not go on even for a moment. You are my very vital breath. Do not go in for the great war. We have Daņḑinī, Mantriņī and crores of other great Śaktis for fighting. Dear child, why do you want to do this now?" Śri Lalitādevī, became curious so when Balamba requested once again for permission to fight, she said “Yes” clasping her in her arms. She took off one of her armours and gave it to her. From her weapons, she gave her the requisite weapons and sent her off. Kūmārikā got into the covered palanquin that had been extracted by the great queen from the staff of her bow and to which hundreds of swans were yoked for drawing. She killed all 30 sons of the demon Bhandasura which was extremely difficult to do. Outside the garbhagraham and in the mahamandapam, at the edge of the chariot which holds Lalithambal and Balamba are Varahi and Raja Shamala. Her face resembling a boar is dark or storm-cloud colored. She wears Karanda-Makuta on her head and is adorned with ornaments made of corals. She wears Nupura on her ankles. 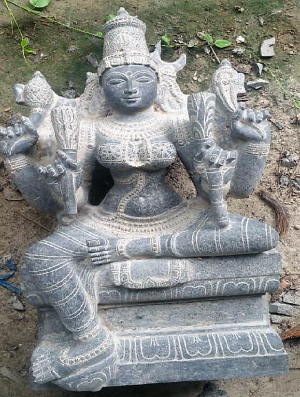 She has a big belly and has four hands, in two of which she carries the changu and chakra; the remaining two hands being respectively held in the Abhaya and Varada poses. 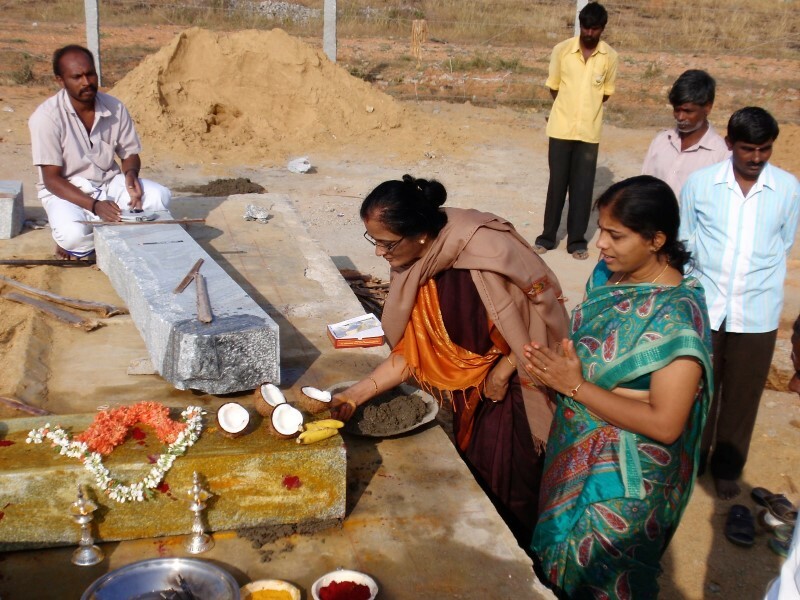 The Purvakaranagama says that she carries the,Saringapdhanus, the Hala and Musala as her weapons. Her Vahana as well as the emblem on her banner is the elephant. She sits there welcoming Balamba’s devotees, waiting to shower her blessings and boons on them all. Varahi is described in many of the puranas: Devi Mahatmya that deals with the killing of the demon Raktabija, says that the warrior-goddess Durga creates the Matrikas from herself, and Varahi being one of them and with their help slaughters the demon army. When the demon Shumbha challenges Durga to single combat, she absorbs the Matrikas into herself. In the Vamana Purana, the Matrikas arise from different parts of the Divine Mother Chandika; Varahi arises from Chandika's back. In the slaying of Raktabija, Varahi is also referred to as the Shakti of Hari, who assumed the incomparable form in a sacrificial boar and also assumed a boar-like form. The Markendeya Purana praises Varahi as a granter of boons and the regent of the northern direction, in a hymn where the Matrikas (forms of Sakthis) are declared as the protectors of the directions. The Devi Bhagavata Purana praises Varahi, who assists the Supreme Mother to fight demons when needed. Raja Shyamala is also referred to as Raja Matangi. She is the Goddess of Knowledge, Talent and Expertise. In their meditative state, ancient rishis provided various paths to reach the Supreme Divine. They gave particular forms and mantras to identify particular aspects of the Divine Mother. Supreme Cosmic Consciousness manifests in the material world as various saguna deities. She is the consort of Lord Shiva and she is also considered as the sister of Lord Vishnu. She connects the phenomenal world with that of the noumenal world and its experiences. This paves the way to break through the cycle of birth and rebirth. Mother gives wisdom as prasada to for us to connect with her Divinity. Human kind, having descended to the material world, revere Goddess Raja Mathangi for her blessings to realize the return journey and yoga with Divine mother. Raja Mathangi is the Goddess presiding over Manifestation. Through her, thought becomes ‘word, unmanifest ‘sound and vibration’ becomes music and ideas unfold into expression. Divine Consciousness becomes the created Universe. Raja Mathangi is the highest of the Goddesses in that She allows all their powers and principles to be realized. 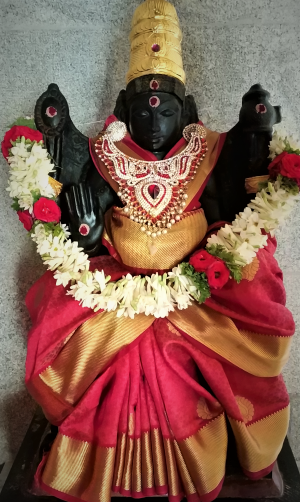 Goddess Raja Matangi is often represented as emerald green in colour or ‘syama varnam’; the color of depth of knowledge and profound life energy. While Ucchishta-Matangini carries a noose, sword, goad, and club, her other well-known form Goddess Raja Matangi, plays the veena. Also Mother Raja Matangi is said to have stood before Mathanga Maharishihka with her twelve hands in a ferocious form to spread her greatness all over the universe. She is seen playing the veena and with a beautiful green parrot. Raja Matangi is also said to be the manifestation of Goddess Meenakshi of Madurai. Raja Rajeswari is the presiding deity of Sri Chakra, she is also the mother of love and grace. She is the personification of the Divine desire to create the universe and also the Divine desire to merge the creation back into the ultimate Brahman (God the father). This two fold desire is the basis of love, the vivifying bond that ties the Creator and the created. She controls our minds and sensory organs and holds the key to transcendental knowledge. She resides on the top of the head (Sahasrara), and also in the second chakra (Swadisthana). She has four hands and three eyes. She wields in her four hands the noose, the goad, sugar cane bow, and five flowered arrows. Her three eyes are Sun, Moon and Fire representing the three triads in creation. Her crown is decorated with the crescent moon the symbol of divine delight. The noose represents strong determination and love by which She binds the whole creation. The goad is the symbol of the power of knowledge, it is the wrath of fiery emotions by which the whole creation is spurred into activity. The sugar cane stem depicts the mind principle of man. The five flowered arrows are the five tanmatras, sound, touch, form, taste and smell - the source of the five elements. She has three forms, the gross physical form (sthula sharira), subtle astral form, (sukshma sharira) and the causal archetypal form of the macrocosm and microcosmic creation. When She is meditated upon, this ultimate energy, in the first and second chakra (Muladhara and Swadhisthana) the sadhaka (spiritual aspirant) is performing internal fire sacrifice. She emerges out of the lotus chakras as Kundalini the supreme power elevating the sadhaka. The graceful Mother removes evil and develops goodness within all of us. She is the power of Brahman; pure consciousness embodied. She is the bliss of "Sat - Chit - Ananda" existence, knowledge and bliss.